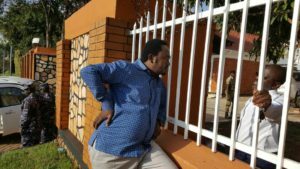 Crispin Kaheru, the Coordinator of the Citizens’ Coalition for Electoral Democracy in Uganda talks to Godber Tumushabe who was by press time holed up in the GLiSS office premises. Photo by Raymond Mayanja. KAMPALA–As NRM legislators prepare to table the bill supporting the lifting of the Presidential age limit, those opposing it like the Lord Mayor Erias Lukwago and Kawempe division councillor Micheal Ziwa have been arrested this morning. Lukwago was arrested at his residence in Wakaliga and taken to Kira Division Police Station. KCCA opposition councillors yesterday launched Togibikula, literally meaning that the Constitution should not be tempered with. Led by Lukwago, the city political leadership had vowed to march to the Constitutional Square currently being manned by the military Police. Through his facebook page last evening, Lukwago urged city dwellers to join him in blocking President Museveni from abrogating the Constitution. He asked all the city leaders to assemble at Lord Mayor’s garden at 9am today for the march. “It’s a clarion call and Constitutional demand for us to rise to the occasion and extricate our motherland off the steep precipice where the NRM regime would like to plunge it,” Lukwago said. He also said it is a huge shame for the “Pearl of Africa” to continue appearing on the list of pariah states and bastion of African despots. “It’s the biggest challenge of our time. It would be treasonable for our generation to abdicate the civic duty enshrined in Article 3 of the Constitution and history will judge us harshly. My humble appeal goes out to the patriotic Members of Parliament opposed to lifting of the presidential age limit. kindly remain firm, resolute, steadfast and assertive,” he added. Meanwhile, the Police yesterday sieged both Action Aid International – Uganda offices in Kansanga and Great Lakes institute for Strategic Studies (GLiSS) on Martyrs Road, Ntinda, Kampala yesterday evening on allegations that the NGOs could be used to fund illegal activities in the city. Both office premises were cordoned off and a search by police officers and detectives was launched. At Action Aid International Uganda offices, the search went on up to about 12:30am when staff was allowed to go. Police took control of the premises and will resume the search today at 10:00am. At GLiSS, the search is still on and by press time, Godber Tumushabe, the analysts who heads GLiSS, was still holed up inside the office premises.